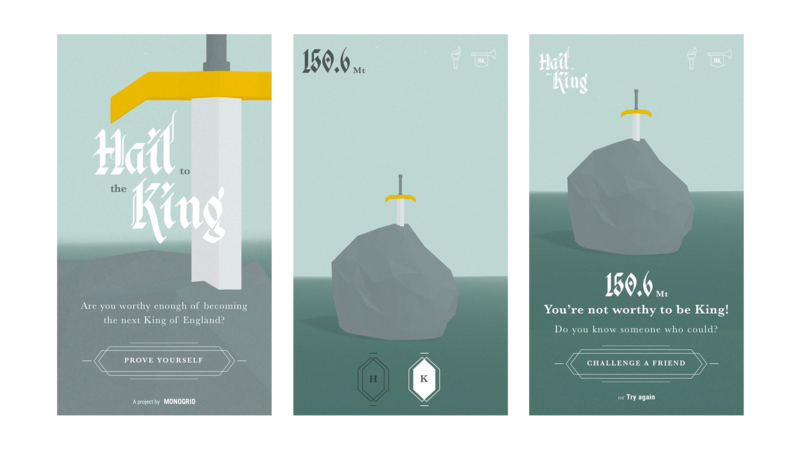 The idea was to create a simple game inspired by the story of Excalibur and King Arthur: the user is invited to pull out the sword from the rock and try to become the next King of England. The game is simple: the user has to alternately press H and K on the keyboard as fast as he can to pull out the sword from the rock. As he plays, the score increases and the sword becomes infinitely long revealing the true intent of the never ending game: no one will ever be the King as the sword cannot be extracted. The music also contributes to transport the user in an epic dimension, with an increase of the angelic choirs. When the game is over the user can try again or share the score on social media and invite their friends to try. A simple and fun game, both for desktop and mobile, intuitive and catchy.